Hi Everyone! How have you been? I've been working on a few more patterns. I finally finished the monogram. "R" is for roses. 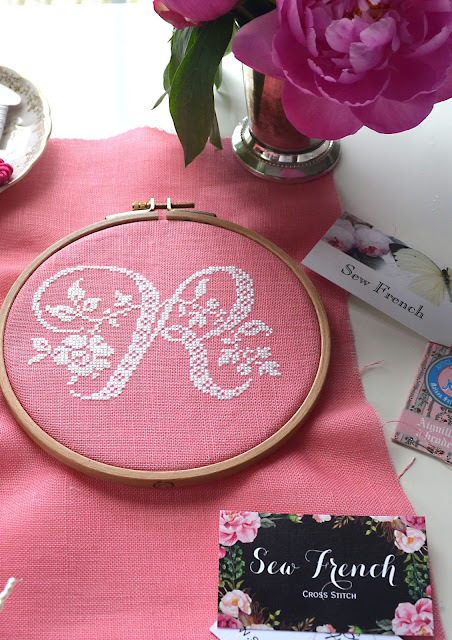 I stitched the monogram on azalea-pink French linen with white silk. Monograms are heirloom pieces that never go out of style. I'll frame this one and add it to my gallery wall. I'm planning on creating a gallery wall with a mix of my own hand stitched pieces, vintage embroidery and Asian embroidery. I love gallery walls but they need to be done right. There are tips and tricks to make them cohesive. Maybe when my gallery wall is finished, I'll be able to snap some decent photos and post them to my Instagram . Yes, I'm back on Instagram. I'm still on the fence about it. If you don't pay for Instagram promotions then no one ever sees your posts. Such is life on social media. I try to update my Instagram on the regular though, whether people see my posts or not. It's fun. 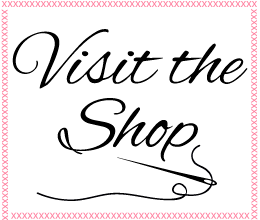 I hoped to add a few more things to the shop last month but life got in the way. You know how that goes. I spend time helping homeless people. I'm trying to devote time to meditative prayer and spiritual reading because it's essential to my life. Anyway, I'm currently stitching a large pattern now. There's always something in my hoop. 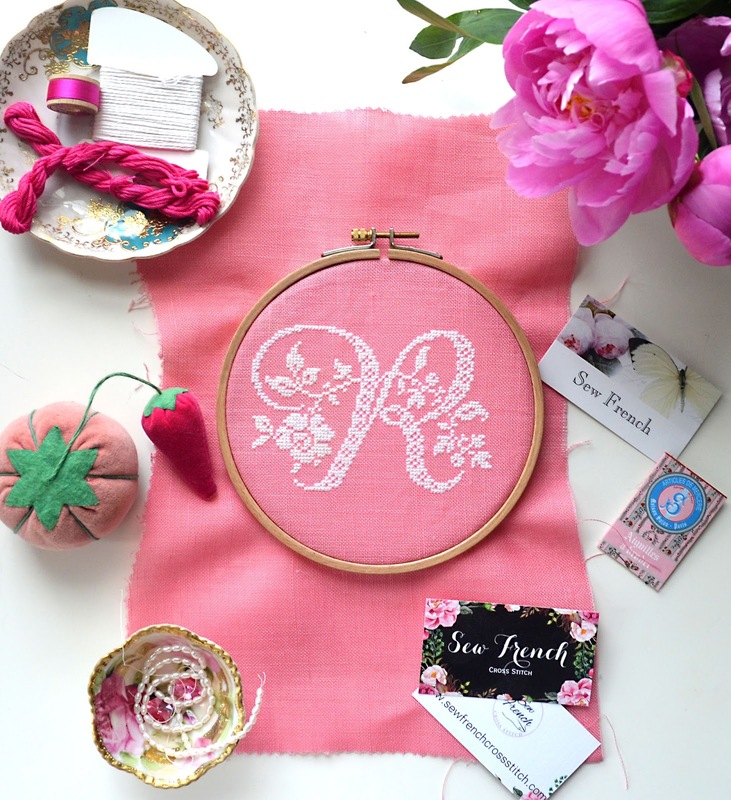 This new pattern is a blooming garden rose stitched with raspberry silk on white linen. I love the way raspberry-pink contrasts with the teal in the teacup saucer too (see images above). The color-pop of pink and teal is pretty. Darker colors always ground pink and make it sophisticated. Pink and black will always be a classic too. Coco Chanel knew that. I'm going to get back to stitching now. 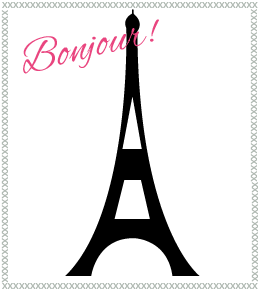 I have a large mug of French-press coffee on my table. Stitching and sipping coffee is a thing on Instagram. 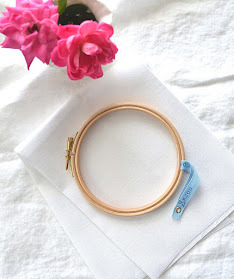 Photos of hoops with embroidery and hands holding a coffee mug pop up in my feed very often. I never tire of looking at the coffee and stitching photos. Coffee and stitching is definitely a thing and they do go quite well together. I'm always happy when a piece of embroidery is framed and ready to hang on the wall. 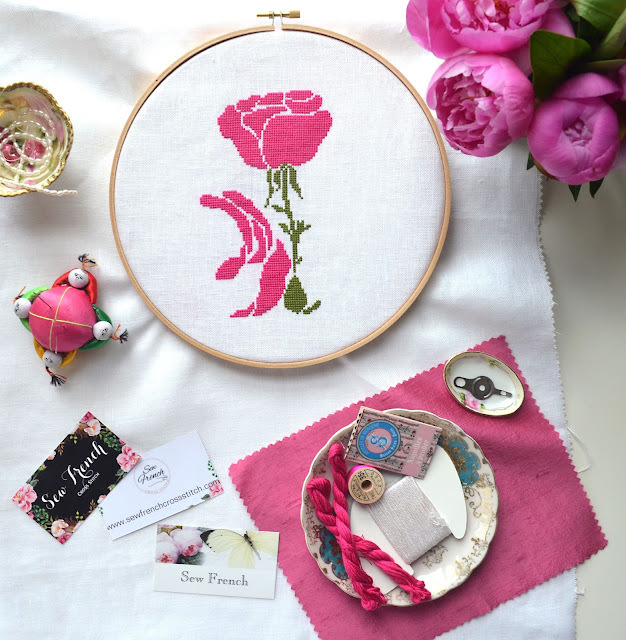 Hand-stitched items really do make a home more soulful, personal and charming. 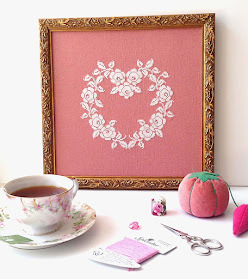 I can't wait to frame my second rose heart pattern. 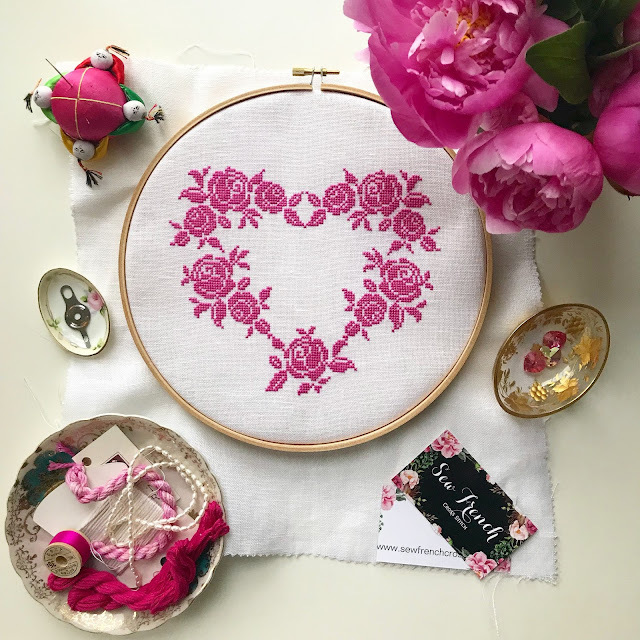 In case you missed it, this rose heart pattern is stitched with raspberry silk on white linen. You can stitch it in your favorite colors. I hope you'll discover the joy of cross stitching. 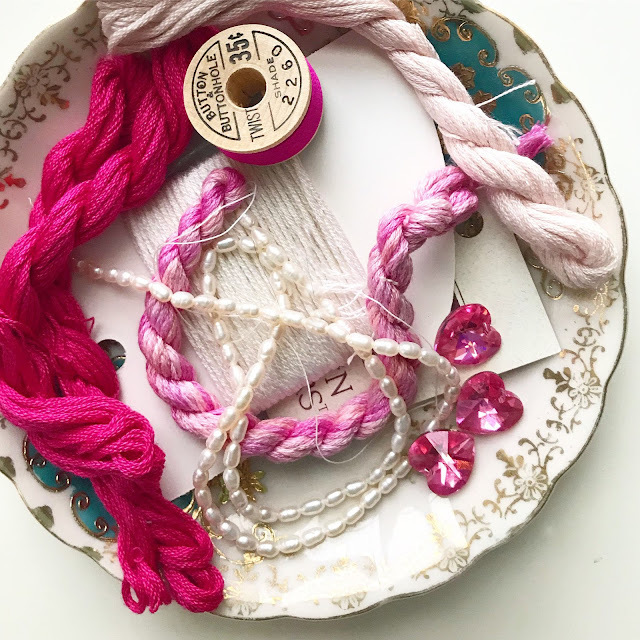 I have fun freebies in my shop with links to teach you how to cross stitch, so please visit and browse for a while. I'd like to thank you all for your support.